Environmental Express turns up the heat on metals digestion with its new HotBlock 200 system. 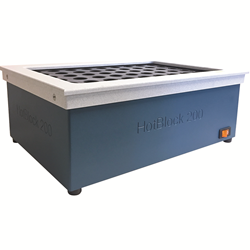 HotBlock 200 from Environmental Express takes metals digestion temperatures up a notch. The redesigned HotBlock® 200 system allows customers to perform metals digestion at higher temperatures—up to a maximum 200°C (392°F), which is above industry standards. It is ideal for use in laboratories that perform environmental testing.